The Photog's Blog: Lightroom 2.6 Networking Version! 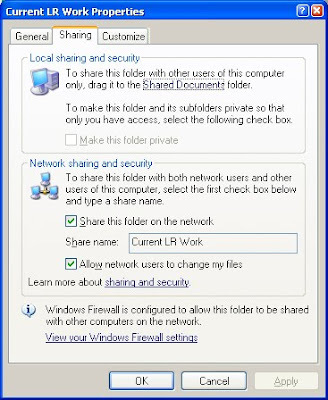 "Map to a Network Drive" does the same thing in Windows Explorer. Thanks for the protip! I have this working just fine on a Windows 7 host shared out to a Windows Vista workstation. The only issue I've noticed is that if the catalog is open on both of my machines, the machine that opened it first experiences problems (images disappear when scrolling, instability) but it doesn't corrupt the catalog. This still works for me since we won't be working in Lightroom at the same time. how about mac.... as far as I know you can not run bat files. Sorry for the delay here. I wish my blog would send me notifications when a comment posts! Glad to hear that it is working on other platforms. As for the Mac, I thought the set-up for this was at that “Team Louish” link in this blog entry. Try it out and let me know!